Hagia Sophia (Holy Wisdom) rises like a rust-colored mountain near the end of Istanbul’s Historic Peninsula, overlooking the confluence of the Sea of Marmara, the Golden Horn and the Bosphorus Strait. The city originated on this peninsula and Hagia Sophia has been there almost since the beginning. OK, that’s not quite true, but it has been there for a very long time. The city originated, as Byzantium, in the 7th century BCE. In the 4th century, the Roman emperor Constantine claimed Byzantium as his capital and renamed the city Constantinople. Constantine was the first Christian emperor of Rome. The building we know as Hagia Sophia was built in 537 CE by the Byzantine Emperor Justinian I, on the ruins of two previous cathedrals. 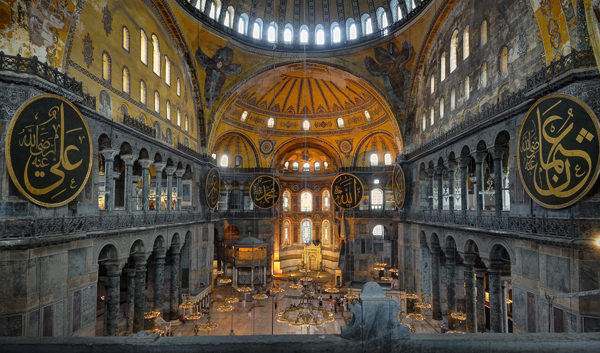 Hagia Sophia stood as the largest cathedral for almost 1,000 years. The dome spans over 100 feet and is 180 feet high. Upon conquering the city in 1453, Sultan Mehmet II was so impressed with the building, he made it his imperial mosque. The design of many subsequent mosques built in the city was influenced by the Hagia Sophia. It’s very impressive from the outside but, for me, the real WOW experience happens inside. It’s just so big and wide-open, you really feel like a speck of dust in there. 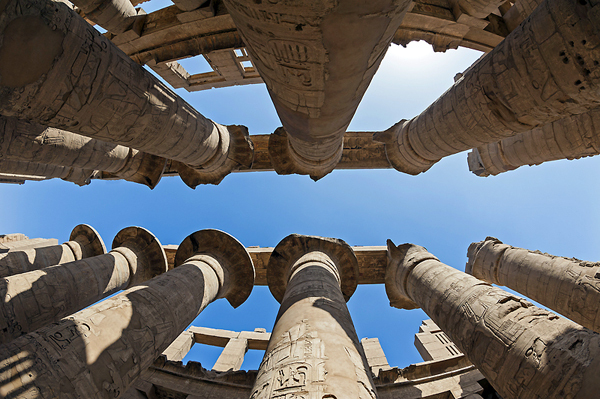 The Karnak temple complex is the 2nd most visited site in Egypt. For 2,000 years, Pharaoh after Pharaoh added to the complex, each trying to outdo the one that came before. The Egyptians called it The Most Sacred Place and it is said to be the largest place of worship ever built. Today, we have over 60 acres of pylons, statues and obelisks to explore. Karnak’s Hypostyle Hall packs the biggest WOW-effect for me, and I’m sure I’m not alone. The central aisle of the hall is lined with 70-foot columns, with a forest of 30-foot columns stretching out on either side. Relief carvings cover the columns and traces of original paint are not hard to find, especially if you look up. 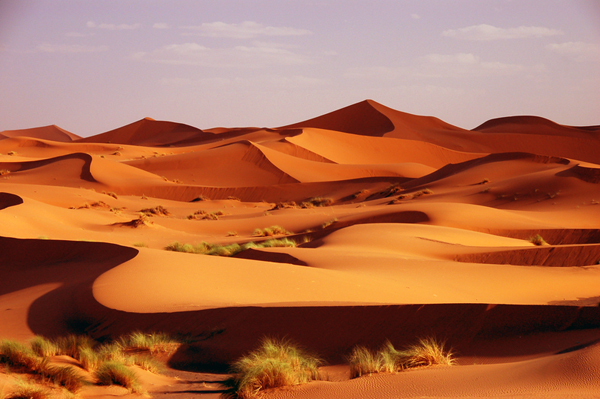 This particular corner of the Sahara is Erg Chebbi in eastern Morocco, near the towns of Erfoud, Rissani and Merzouga. (An erg is a large area of shifting dunes.) Flaming waves of sand rise and plunge, rise and plunge, rise and plunge, across 200 square miles. For a daughter of the American Pacific Northwest, no more alien landscape exists on earth. A Moroccan friend visiting Portland once said of our city, “You can taste the green.” To match my friend’s concise, poetic statement about my home, I offer a vague and rambling one about hers. Aside from the visual appeal of the clean, almost geometric panorama, the stark, primal environment promotes contemplation. It’s you, the sand and the sky. In fact, our modern, global culture is largely founded on desert inspiration. Islam and Judaism were born in deserts. Desert ascetics shaped early Christianity. So, the WOW experience of the Sahara is both expansive and deep. And you CAN taste the desert, probably literally; that sand gets in everything. This entry was posted in Egypt, Istanbul, Morocco, Turkey, Uncategorized, WOW Places and tagged Egypt, erfoud, erg chebbi, erg chebi, Hagia Sophia, hypostyle hall, Istanbul, karnak temple, luxor, Merzouga, Morocco, rissani, Sahara, Turkey by yalla2013. Bookmark the permalink.